Having gotten in so late last night, we had no opportunity to explore the city outside the few blocks near the hostel. Today, all of Budapest was our oyster! We had planned to see everything on our list, so we could leave our last full day just relaxing. Planned being the emphasized word. We got up with the usual fanfare, took showers and went downstairs for cereal and toast in the common room of the hostel. With full bellies and map in hand we hit the pavement to explore the city. First up, City Park. 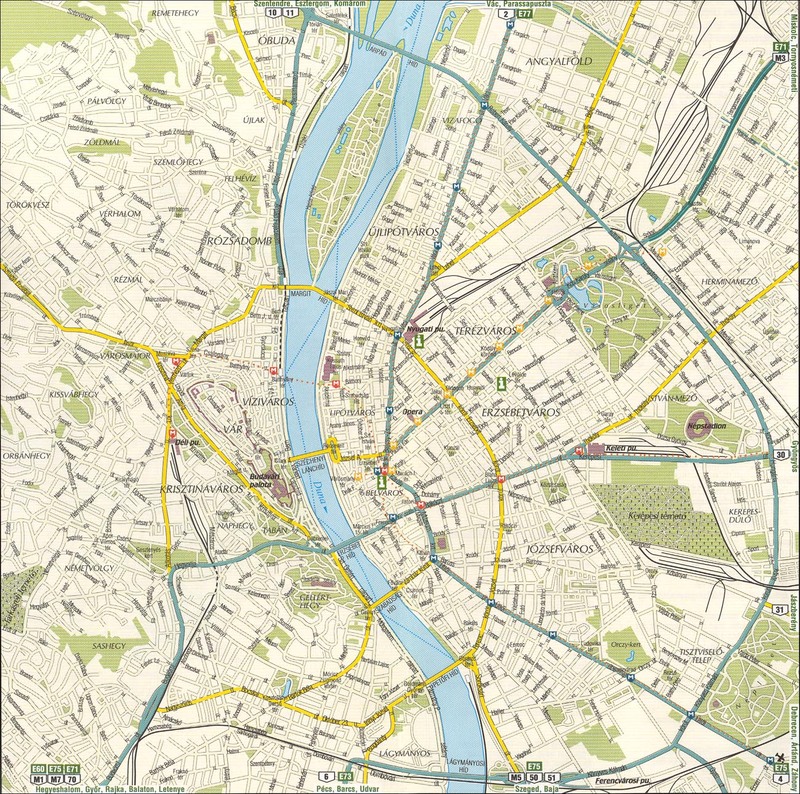 The map's editor had said it was their favorite place in Budapest and that it had a flea market on the weekends. Flea market!? We're there! We went there straight away, took some pictures at Heroes Square and Vajdahunyad Castle and then went searching for the flea market. We found the zoo, baths, the circus and the amusement park but no flea market. But then we saw a handful of stands selling swap meet style junk, very disappointing. This was not the antiques and collectibles we were anticipating. Guess the map editor and us do not have similar views on flea markets. We then hiked to the opposite end of Pest to see St. Stephen's Basilica, the Communist Monument and Parliament. That's about the time I started doing a jig, I desperately needed to find a bathroom. Of course, today is Sunday many businesses are closed and we were not in a heavy tourist area. What is a girl to do?! Run as fast as she can to the nearest McDonald's, that's what! Having taken care of this first order of business, we came to even more important business...what to have for lunch. We really wanted to have more Hungarian food, but didn't want to pay an arm and a leg. We headed away from McDonald's and found a little hole in the wall cafeteria that served all sorts of Hungarian dishes. The women there were super friendly and spoke excellent English and helped us make our selections (steering me away from the liver, eep!) Lunch was amazing, so good, both of our plates were licked clean. Then it was off to Margaret Island! We went following a recommendation from my former co-worker, Andy, and he was spot on! The island is gorgeous and is like a never ending park tucked right in the middle of the Danube. We walked from one end to the other, taking breaks now and again to rest our legs. We gave up on the castle visit for the time being and headed back to the hostel for much needed naps, but making sure we got some much deserved ice cream along the way. Hours later, we both woke up feeling refreshed but sore. We knew we would at least have to venture out for dinner or supplies, so why not capitalize on it and go see the castle at dusk (another Andy recommendation) So we walked along Fashion Street along the Danube embankment. When we went to cross the Chain Bridge we got a welcomed surprise, a summer festival! They closed off the bridge to vehicle traffic and had stages on either end of the bridge and vendors across the length. It was really fun to be a part of. On the Buda side we made our way to Elizabeth Bridge right at the twilight hour, so Charlton got some amazing pictures. Was absolutely gorgeous. Back in Pest, we checked the clock...9:15! The kitchen in the hostel is only available until 10! And most affordable restaurants we already closed. So we hoofed it to the nearest grocery store (luckily a 24 hour one) and grabbed some soups and ran back to the hostel. I heated them up as fast as I could and we scarfed them down. Not that great, but it was something. Hopefully, tomorrow we wont be so rushed. It has been a long day in a beautiful city. Still seems like there is a lot left to see, really looking forward to seeing more. No doubt about it, today was going to be a travel day. We got more than we bargained for though! Starting the day off in Zagreb, we knew we had to catch the 10am train to Budapest which was due to arrive at 4:30pm. OK, we're getting to Eastern Europe. I'm not expecting everything to be smooth. This area is a little rough around the edges, but I figured if we went with the flow it should be all good. So we arrive at the train station at about 9:30 and head to our track. While walking there I'm trying to decide what kind of train we're going to get. First thought, "Well Croatia is getting to be wealthier so maybe they have a brand new train for us. That would be nice." then second thought, "This is Croatia, we're going to Hungary, I'll probably be riding on a train made of wood sitting next to a goat and a fat Hungarian mama with a big mole on her nose." So yeah, not thrilling but not bad either. It was like a lazy Sunday with reading and napping all while looking at the rainy countryside. However, with rain comes tardiness as far as trains are concerned. So unfortunately, we didn't arrive in Budapest until 7:30pm, about three hours and some change late. You win some and you lose some. Once here we headed to our hostel, which is nice. Immediately after we headed off to get some dinner and found a nice restaurant with some Hungarian food. We ended up with a nice pepper soup and potato dumplings. Very filling and good. Once back to our hostel we're resting for the day tomorrow! So far I like Budapest. It's attractive and cheap. Both are qualities I look for in a city. Earlier today I was lamenting at some of the cities I've visited that are in Eastern Europe (Bratislava, Zagreb), basically since the Euro has come about, plus the weak U.S. Dollar, it's not cheap to travel there. Many times it's more expensive that the United States. While that was surprising to me, it also makes me enjoy the cities in France and Germany. Yes they are expensive, but you get all the amenities with it. In the more "remote" Euro countries, you just get a big bill. Oh well, been there done that. Next time I'll just wait for the Dollar to get stronger, though that may be a long wait.